September 2013 marked the tenth annual National Preparedness Month, sponsored by the Federal Emergency Management Agency (FEMA). In recognition of emergency preparedness as a public health issue, ICH is continuing its efforts to raise awareness about emergency preparedness. In the wake of recent natural and man-made disasters, the term “emergency preparedness” has often been used; however, few people know exactly what it entails, especially as it pertains to health and medical preparedness. I came to know more about this field as an evaluator for the Partnership for Effective Community Response (PEER) — a disaster preparedness coalition for the Greater Boston area. The PEER program was hosted by Boston University School of Public Health (BUSPH) and included representatives from hospitals, community health centers, emergency medical services, long-term care centers, and 62 cities and towns’ local health departments. PEER’s work centered on improving communications and response protocols, supporting mutual aid agreements, and offering necessary trainings. ICH served as the lead evaluator for the initiative, assessing the coalition’s processes and outcomes and providing technical assistance for PEER activities. Working on a number of these activities and interacting with our partners at BUSPH fueled my interest in delving deeper into emergency preparedness as a public health issue. We often associate emergency preparedness with terrorist attacks, as the major American push for emergency preparedness came after 9/11 and the subsequent anthrax attacks. These events led the federal government to institute funding for states to support preparedness work for such disaster scenarios. However in 2004, the focus shifted from bioterrorism to an “all hazards” approach, involving preparation for common elements of all emergencies. Going beyond terrorist attacks, this approach encompassed preparedness for all natural disasters, mass casualties, chemical and biological threats. This approach centered on communities’ ability to meet the health care needs of their residents in the event of an emergency or disaster. As a result, the Assistant Secretary for Preparedness and Response (ASPR) — with the passage of the Pandemic and all-Hazards Preparedness Act — was created to ensure that health care systems were prepared to meet these needs. As a part of this continuing effort, in 2012 ASPR and the Centers for Disease Control and Prevention (CDC) issued guidance for the establishment of multi-disciplinary health care coalitions, emphasizing that such partnerships are integral to emergency preparedness and strategy coordination for an “all-hazard” approach. Massachusetts experienced a number of emergency situations over the past couple of years, including the Boston Marathon bombings, Hurricane Sandy, Nor’easters, and the influenza pandemics (H1N1 and swine flu), which have heightened awareness about emergency preparedness across the Commonwealth. 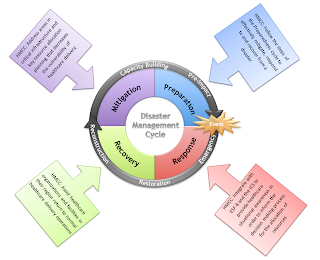 This heightened awareness has come at a time when MA is also refocusing its emergency preparedness strategies to include a more integrated approach and response that will enhance MA’s health and medical capacity across the disaster management cycle (planning, response, recovery, and mitigation). Creating cross-jurisdictional, multi-disciplinary health and medical coordinating coalitions (HMCC) will help to improve communication capacity between facilities during emergencies. The Massachusetts Department of Public Health Emergency Preparedness Bureau (MDPH EPB), with assistance from BUSPH, is currently in the planning phase of establishing six HMCC’s in each of the hospital preparedness regions in Massachusetts: Region 1, 2, 3, 4ab, 5, and Boston. Each region’s HMCC will support preparedness and response efforts for the multiple public and private health and health care organizations, including acute care facilities, community health centers and other large ambulatory care organizations, emergency medical service providers, long-term care facilities, public health agencies, and other health care disciplines and public safety partners within each region. Staff from each HMCC will be able to provide coordinated support and response for affected individual agencies within its region during an emergency. ICH will once again be engaged as the evaluator for this coalition building, and I look forward to contributing to such a critical endeavor. As the state continues to ensure appropriate systems are in place for emergency situations, it is important that we—public health professionals, practitioners, partners, and community members— follow MA’s lead and consider how our networks could be affected in an emergency. Especially as the fall and winter months approach, we should all take steps to ensure our communities, workplaces, and families are prepared.